The Quinnipiac Bobcats (7-2-1, 2-0 ECAC Hockey) look to keep the train rolling this Friday when they host their rival the Clarkson Golden Knights (6-3-1, 2-0-0 ECAC Hockey). Last season, the ECAC was governed by Quinnipiac who finished the season with a 16-2-4 record in the conference. The team looks to keep the trend going coming off of back-to-back wins this past weekend against Yale and Brown University. After a home-and-home series with Boston College in which the Bobcats lost and tied a game apiece, Quinnipiac came out of the gates flying against the Yale University Bulldogs. After a pointless weekend against the Eagles, T.T. Cianfarano got back into a scoring groove netting one just 53 seconds into the second period on the power play. With the clock winding down with under a minute left to play in the second period, sophomore forward Kenzie Lancaster notched her first collegiate goal and the first of her career with the Bobcats. The team would go on to add two more in the third with power play goals coming from Cianfarano and Meghan Turner. From the minute the team stepped on the ice at Meehan Auditorium in Brown University, it was all Quinnipiac. The Bobcats stormed to an 8-0 win with goals coming from eight different players, including three on the power play. Clarkson started ECAC play going up against Harvard University and Dartmouth College this past weekend and reaffirmed that they belong right in the mix with top contenders scoring 10 goals while only allowing one. The Golden Knights found themselves scoreless after the first period on Friday but flipped the switch just 02:49 into the second period. Cayley Mercer proved her skill as a forward, scoring the first goal of the game. They went on to win 4-0 with Mercer adding another goal. Rhyen McGill and Jessica Gillham scored the other two for Clarkson. Clarkson then faced off with Dartmouth College who was no match for the Golden Knights. Goals were scored by six different players and they moved on to win the game 6-1. Quinnipiac: T.T. Cianfarano. After struggling to find herself on the score sheet against Boston College, she came back with a vengeance scoring two key power play goals against Yale as well as one late in the game at Brown. She is just five away from the 100 point mark, so keep an eye on her to see if her dominant play continues. Clarkson: Shea Tiley. After playing 10 games in the crease so far this season, she has posted a .928 save percentage and a 1.83 goals against average. Last season in a 1-0 win over Quinnipiac in the NCAA Quarterfinals, she stopped all 14 shots that she faced. The Bobcats will have to add more firepower to the mix because when at the top of her game, Tiley is not one to be reckoned with. Quinnipiac: Expected to start in between the pipes for the Bobcats is Sydney Rossman. Rossman has been solid this year, posting a 1.18 goals against average and a .937 save percentage. She currently sits at 23 career shutouts, just three away from the program record. Clarkson: Shea Tiley will most likely be in net for the Golden Knights. She is very familiar with the Bobcats having posted a 14 save shutout the last time they met. So far this season, she has posted a .928 save percentage and a 1.83 goals-against average. The Bobcats have traded blows back and forth with the Golden Knights in previous years. They beat them 1-0 in last year’s ECAC Hockey Championship game, but fell to them in the NCAA Quarterfinals by the same score. 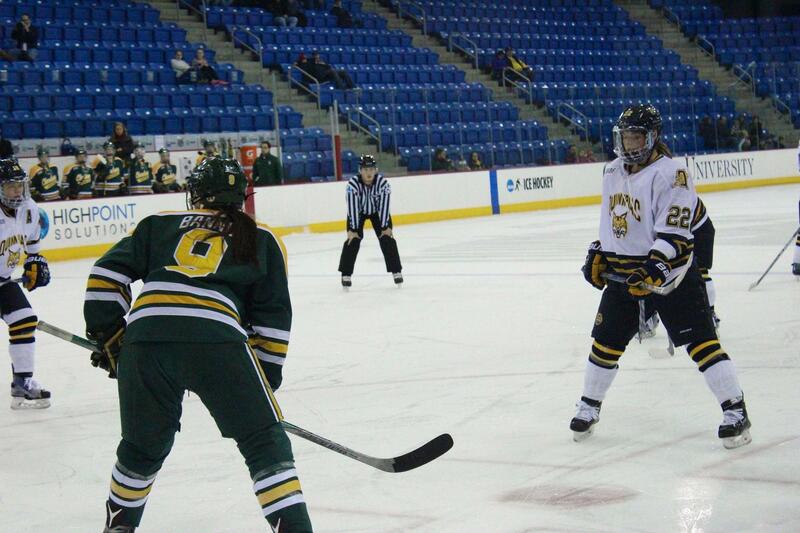 Including postseason play, Quinnipiac had a 2-1-1 record against Clarkson last season. The team will look to continue its success this season when it faces off against its rival on Friday night.